The first in some famous crimes recorded in various Tamil Nadu police journals. The injured MGR signing his nomination papers for elections from his hospital bed. M.R. Radha. In several superhit Tamil movies of the 1960s, M.G. Ramachandran, or MGR as the 50-year old matinee idol was popularly known, played the role of the hero, and M.R. 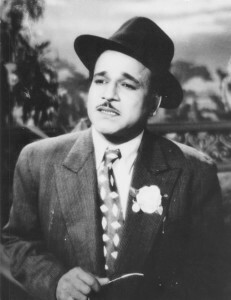 Radha, aged 57, acted as the villain. (MGR later became the Chief Minister of Tamil Nadu in 1977 and headed the government till his death in 1987.) Unfortunately, their real life started imitating the reel one and they developed serious differences. Their Tamil movie Petral Than Pillaiya, produced by Vasu, was a superhit in which MGR was the hero and M.R. Radha was the villain. However, by this time, the rift between them on several issues had further widened. 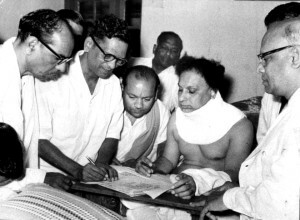 This was the time when the Dravida Munnetra Kazhagam (DMK) was seriously challenging the supremacy of the Congress Party that had been ruling the State since Independence. MGR was the star campaigner for the DMK Party during the 1967 General Elections to the State Legislature. He also contested as a DMK candidate from the St. Thomas’ Mount Assembly Constituency. On January 12, 1967, M.R. Radha, at around 4.00 p.m. went to MGR’s house at St. Thomas’ Mount accompanied by Vasu. They were warmly received by MGR. However, soon after the exchange of pleasantries, a heated argument broke out between Radha and MGR over some film-related matters. Accusing MGR of deliberately destroying his acting career, Radha got up angrily and walked towards the exit. Suddenly, he turned around, whipped out a revolver tucked into his dhoti and fired at MGR at point-blank range. MGR sustained a bullet injury on his neck and lower portion of his left ear. Shocked by this sudden incident, Vasu pounced on Radha and restrained him from shooting again. However, M.R. Radha wriggled out and shot at himself. Both the actors were rushed to the Government Hospital, Royapettah, for immediate treatment for their bleeding injuries and later to the General Hospital, Madras. The doctors performed emergency operations, and both were reported out of danger. On hearing this news, a big crowd gathered in no time near the hospital, anxious to know the health condition of their popular hero. Very soon, the crowd became massive and violent. Some of them started pelting stones at the policemen on crowd control duty, besides damaging street lights and public properties. The unruly mob also barged into the garden of M.R. Radha at St. Thomas’ Mount and set a shed on fire. To bring the situation under control, the police had to resort to a lathi charge followed by teargas to chase the crowd away. In the melee, many policemen sustained injuries. A case in connection with this use of a firearm was registered in the St. Thomas’ Mount Police Station. Subsequently, this was transferred to the Crime Branch CID and the investigation was entrusted to G.K. Ranganathan, DSP, CB-CID. The investigation revealed that both MGR and M.R. Radha were each in possession of a 420 calibre Webley & Scott revolver and both had purchased these revolvers on the same day from P.Orr and Sons, Madras, in the early 1950s. Both weapons had cylinders that were identical. The seven broad grooves and seven narrow ‘lands’ inside their barrels had a right-hand twist and their triggers needed a 15-to-20-pound pressure. MGR renewed his revolver licence periodically, whereas Radha failed to do so, and his arm licence had expired in 1964 itself. He had even failed to deposit the revolver with the authority concerned after expiry of his licence and, thus, he was in possession of a revolver without a valid licence on that fateful day. As per the sequence of events that unfolded during the CB-CID probe, Radha had gone to MGR’s house at Nandambakkam, near St. Thomas’ Mount, on January 12, 1967, with the intention of committing murder and fired one round with his revolver at him from a close range. The bullet pierced through MGR’s left ear and lodged in the pre-vertebral region. MGR had a miraculous escape. Thereafter, Radha attempted to commit suicide by shooting at himself twice with the same revolver, once in the temporal region and then on his neck. M.R. Radha was arrested on January 12, 1967, and remanded. He was charge sheeted by the CB-CID for several offences. But during the trial, he alleged that it was MGR who had shot at him! However, the prosecution witnesses, including C.K. Ranganathan, DSP, CB-CID and A.V. Subramaniam, firearms expert, convinced the court that the allegation of the accused was false and that the crime bullets had come only from M.R. Radha’s revolver. There was no evidence against MGR and the report of the Director, State Forensic Science Laboratory, clearly stated that the bullets removed from Radha’s neck and head had been fired from Radha’s own revolver. The firearms expert deposed that the revolver used in the shooting incident on January belonged to Radha. The revolver was in good condition and had a 25-yard effective lethal range. The expert also found three unused British-made cartridges of 420 gauge with the “Kynoch” trade mark in the revolver. The three cartridges were shaky, indicating a loose fit due to defective ammunition. The expert also opined that this revolver could be concealed in the waist by a person wearing a dhoti. Vasu had stated that he and Radha visited MGR on January 12 because a “party” from Coimbatore that was staying at Hotel Ashok was keen on producing a film, with MGR playing the title role. However, the investigating officer checked with the hotel register and found that no one from Coimbatore connected with the film business had stayed at the hotel during that period. On completion of the trial, the accused Radha was convicted by P. Lakshmanan, Sessions Judge, Madras on November 4, 1967, and sentenced to 7 years’ RI for having attempted to murder MGR. In addition, he was sentenced 2 years’ RI each for keeping an unlicenced revolver without surrendering it to the police after expiry of the licenced period and using it to commit an offence. He was also awarded 6 months’ simple imprisonment for attempt to commit suicide. All the sentences were to run concurrently. Many people, including MGR himself, were curious to know as to why the shot from a powerful 420 Webley & Scott revolver at a close range did not prove a fatal one. In an article for a newspaper, Dr. P. Chandrasekaran, a noted forensic expert, explained: “There could be only one reason for both having escaped from death. I guessed the bullets emanated from the revolver did not have enough muscle velocity to cause lethal damage”. (Source: Crime Branch CID, Tamil Nadu, A Retrospect (1906-2010). The accused, though not a member of DK, was an ardent supporter of that Party and a follower of the Party leader, E.V. Ramaswamy Naicker. Before the last general elections, the DK supported the Congress Party in Madras State. Professional jealousy had been proved by evidence that MGR was a well-known film star and a matinee idol and drama actor. Radha was also a prominent film and drama actor, but his ‘market’ was falling, according to evidence. The prosecution had also proved that Radha was “financially frustrated” at the time of the shooting incident by showing that he was indebted to the tune of about Rs. 7 lakh. If it was true that Radha earned about Rs. 50,000 a month by acting in dramas alone, as claimed by him, he could not have incurred so much debts. In a case depending on circumstantial evidence, the question of motive was of great importance. If no motive was adduced, it was a circumstance in favour of the accused. But where there was direct testimony of the evidence of an eye-witness, it was well settled that it was needless to adduce motive. Radha harboured a grudge against MGR because he was under the impression that MGR was conspiring to murder the Congress leader Kamaraj by engaging ‘goondas’ offering them Rs. 2 lakh from his “superfluous money” and his earnings. This impression was entirely wrong as MGR had participated in the birthday celebrations of Kamaraj and he was in fact taken to task by his Party (DMK) for praising an opposition party leader. He was therefore satisfied that there was ample proof of motive for the accused to murder MGR. He did not rely on the defence theory that the two cartridges found in Radha’s bag were planted there by MGR’s men. If there was really a struggle between MGR and Radha for the gun and if Radha had wrested it from MGR, MGR should have attempted to get hold of the accused once again to wrest the revolver from him or run away a considerable distance from Radha or at any rate could have ducked; and if he had done so, he would not have been injured near the ear by a gun held at point blank range. The version of the accused did not fit in with the nature of the injury on MGR. He also accepted the prosecution theory that the two injuries on Radha were self inflicted. It was impossible for any third party to cause such a wound where, according to his (Radha’s) own version, he fell face down. Referring to “severe criticisms” about the washing of MGR’s clothes before they were handed over to the police, he said that as there was no struggle between the accused and MGR, it would follow that there was no scope for MGR’s clothes being stained with Radha’s blood. Referring to the defence arguments on Vasu, Chakkrapani and others seeking legal advice before handing over Radha’s revolver to the police, he said that it was quite understandable for Vasu to do so because he was the only eye-witness of the incident and being in possession of the crime revolver, he was in a ‘fix’ and was nervous and feared that he would be implicated in the crime. He had come to the conclusion that the accused had personal jealousy and political animosity and had the intention to kill MGR and become a ‘martyr’ of the DK. MGR’s injury was not due to an accident, not was there any scope for Radha’s plea for self-defence. It was a well planned plot to commit a dastardly crime in a sneaky manner and which, but for his old age 57, would call for severe punishment.